between the point of suspension and the center of gravity of the spherical bob. This distance can be measured to a very fair degree of accuracy. Unfortunately the different observations vary among themselves by quantities even greater than the errors of the diffraction method. 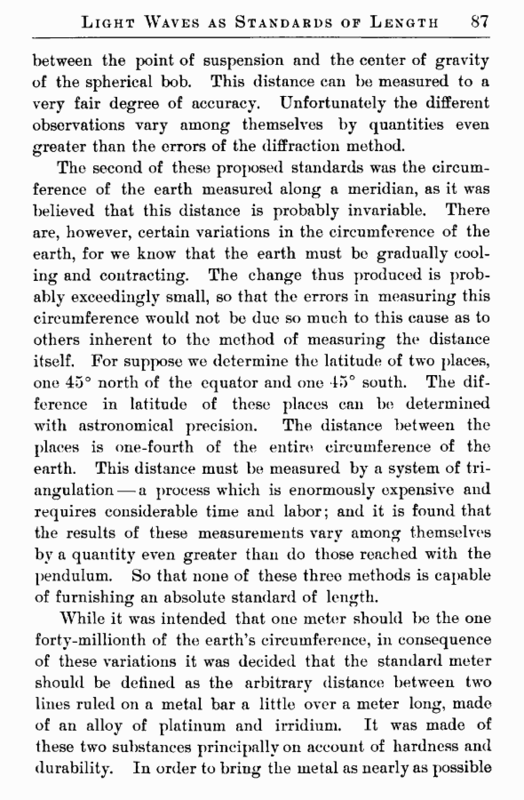 The second of these proposed standards was the circumference of the earth measured along a meridian, as it was believed that this distance is probably invariable. There are, however, certain variations in the circumference of the earth, for we know that the earth must be gradually cooling and contracting. The change thus produced is probably exceedingly small, so that the errors in measuring this circumference would not be due so much to this cause as to others inherent to the method of measuring the distance itself. For suppose we determine the latitude of two places, one 45° north of the equator and one 45° south. The difference in latitude of these places can be determined with astronomical precision. The distance between the places is one-fourth of the entire circumference of the earth. This distance must be measured by a system of tri-angulation— a process which is enormously expensive and requires considerable time and labor; and it is found that the results of these measurements vary among themselves by a quantity even greater than do those reached with the pendulum. So that none of these three methods is capable of furnishing an absolute standard of length. to what was termed its “ permanent condition,” these bars were subjected to all sorts of treatment and maltreatment. The originals were cast and recast a great many times, and afterward they were cooled—a process which took several months. After such treatment it is believed that the alteration in length of these bars will be exceedingly small, if anything at all. 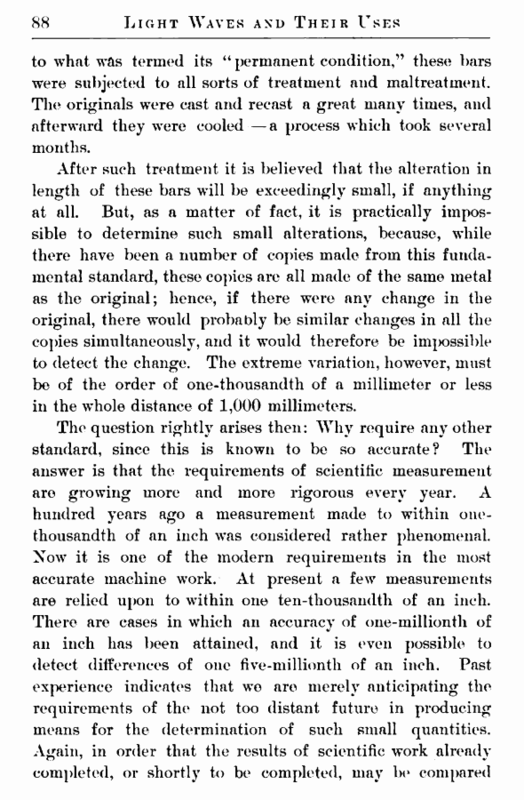 But, as a matter of fact, it is practically impossible to determine such small alterations, because, while there have been a number of copies made from this fundamental standard, these copies are all made of the same metal as the original; hence, if there were any change in the original, there would probably be similar changes in all the copies simultaneously, and it would therefore be impossible to detect the change. The extreme variation, however, must be of the order of one-thousandth of a millimeter or less in the whole distance of 1,000 millimeters.